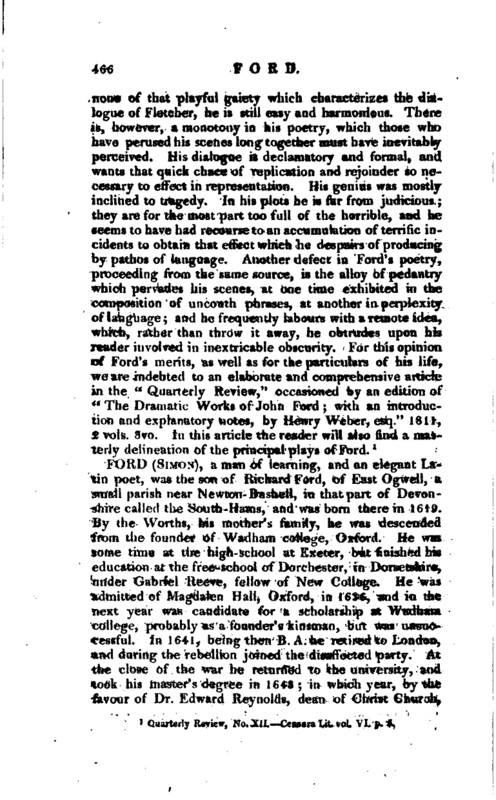 , a man of learning, and an elegant Latin poet, was the son of Richard Ford, of East Ogwell, a small parish near Newton-Bushell, in that part of Devonshire called the South-Hams, and was born there in 1619. 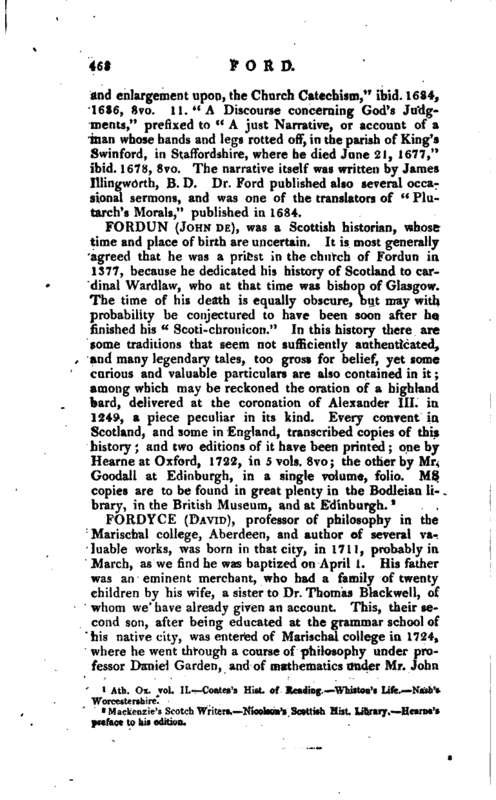 By the Worths, his mother’s family, he was descended from the founder of Wadham college, Oxford. He was some time at the high-school at Exeter, but finished his education at the free-school of Dorchester, in Dorsetshire, under Gabriel Reeve, fellow of New College. He was admitted of Magdalen Hall, Oxford, in 1636, and in the next year was candidate for a scholarship at Wadham college, probably as a founder’s kinsman, but was unsuccessful. In 1641, being then B. A. he retired to London, and during the rebellion joined the disaffected party. At the close of the war he returned to the university, and took his master’s degree in 1648; in which year, by the favour of Dr. Edward Reynolds, dean of Christ Church, | one of the visitors of the university appointed by parliament, he became a student of that house, and distinguished himself as a tutor. He was created B. D. Feb. 16, 1649, by dispensation of the delegates, who had before decreed, that, having been “expelled the university with great injury, he should be restored with all academical honour imaginable.” He then became a frequent preacher at the university; but, for preaching at St. Mary’s against the oath of the Independents called the engagement, as he himself informed Anthony Wood, he was expelled from his studentship. 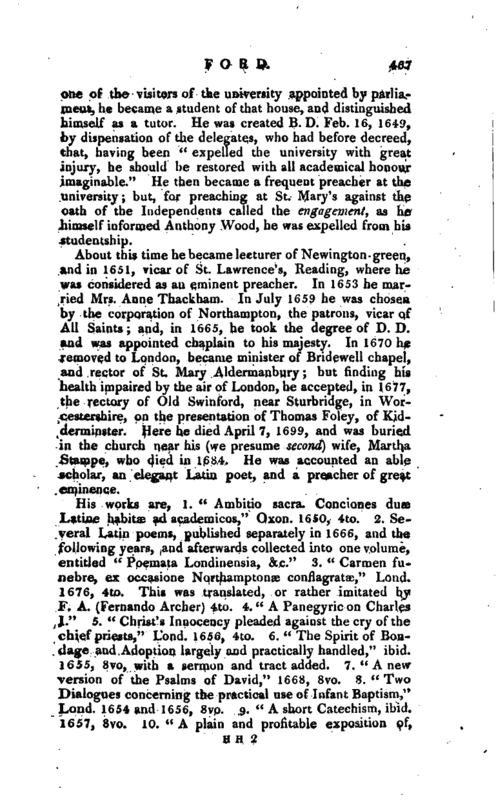 About this time he became lecturer of Newington-green, and in 1651, vicar of St. Lawrence’s, Reading, where he was considered as an eminent preacher. In 1653 he married Mrs. Anne Thackham. In July 1659 he was chosen by the corporation of Northampton, the patrons, vicar of All Saints; and, in 1665, he took the degree of D. D. and was appointed chaplain to his majesty. In 1670 he removed to London, became minister of Bridewell chapel, and rector of St. Mary Aldermanbury but finding his health impaired by the air of London, he accepted, in 1677, the rectory of Old Swinford, near Sturbridge, in Worcestershire, on the presentation of Thomas Foley, of Kidderminster. Here he died April 7, 1699, and was buried in the church near his (we presume second) wife, Martha Stampe, who died in 1684. He was accounted an able scholar, an elegant Latin poet, and a preacher of great eminence. Ath. Ox. vol. II. Coatei’i Hist, of Reading. Whi*ton’s Life. Nash’s Worcestershire.